In a previous post, I wrote a bit about my Saturday night photojournalism adventure. 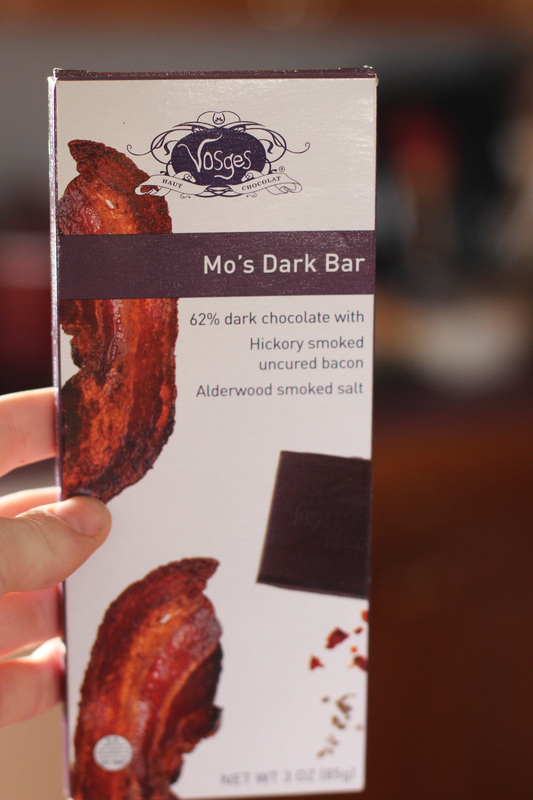 Before I went out to eat that amazing pomodoro dish, the woman who owned the house (where I was photographing my gracious subject working on her art installation) gave the two of us a couple of gourmet bars of Chicago’s very own Vosges Haut-Chocolat, one with bacon and one with carrot. Playing off the wonderful and unexpected gift, she said, “I know the owner, so you have no idea how many chocolate bars I have in my freezer. No big deal.” But it was a pretty big deal for me because I already think people are way too nice. This woman let me into her house to photograph my calligraphy subject artist friend, who obviously let me hang out with her for three hours to photograph her, then they give me chocolate to boot? Love it. As a functional chocoholic, as long as the chocolate bar doesn’t contain fish or seafood, I’d probably eat it. In my opinion, any way to enjoy chocolate in a different way is great, but apparently I’m a bit unique in this idea. Bacon chocolate? Carrot chocolate? Sure, that can sound outlandish, but don’t think about it. Just try it. (Okay, I thought about it a lot, but that’s because it made me more excited to taste-test these chocolate bars.) Basically my point is to not judge chocolate. Eat it. No judging. I promise it’ll be delicious. Here’s why. Maybe bacon chocolate isn’t really a novel thing for me, since I got a wonderful sample of bacon peanut butter cups at the Chicago Fine Chocolate Show a little over a month ago. Besides creamy, high-quality dark chocolate, this bar contains hickory smoked uncured bacon, as well as alderwood smoked salt, so yep, I’m in. As I expected, the smoky bacon flavor enhanced the chocolate in a way that’s difficult to describe in words. It’s almost reminiscent of the way you might accidentally get a bite of bacon with your chocolate chip pancakes – like, okay, maybe you didn’t ever consider the combination, but once you’ve tried it, you’re obsessed. Or at least I am. The uber-subtle bacon flavor seems like it’s meant to go with the chocolate. I’m not sure if it was a special blend of chocolate or whatever, since I’m doing this taste test out of my own pure enjoyment with little incentive besides happiness, but I wouldn’t be surprised if it were. 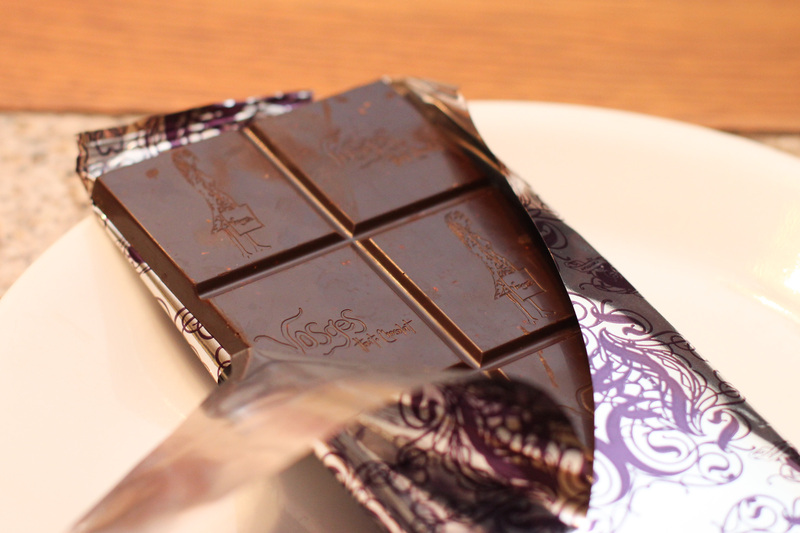 If you could find a savory chocolate bar, this is it. AND THAT CRUNCH. In the photo above, you might be able to catch a glimpse of the bacon within the chocolate bar, and for me and my texture-based taste buds, the crunch really makes it. If you didn’t know this was bacon chocolate, this would have you wondering if there’s just weird crispy rice or nuts or something in it. But the way it crunches between your teeth definitely confirms that it’s bacon. All the crunch and flavor without the grease. So good. Imma go become a bacon-chocolate prophet now. I sort of knew what to expect going into the bacon bar, but the carrot one was new territory for me. Before opening it, I pondered what it might taste like. I thought of cooked carrots (which would admittedly taste super weird in a chocolate bar), that carrot soup I had a couple times in Guatemala (which had such an umami quality that a similar carrot flavor would make this bar a lot like the bacon bar) and finally carrot cake (which tastes more like cinnamon cake not from the carrots and therefore probably wouldn’t be an accurate flavor prediction for this chocolate). Enough guessing – I snapped my photos and immediately dug in. Having just delighted in the savory bacon chocolate, this chocolate’s sweetness threw me off-guard for the first couple of bites. The fact that it was milk chocolate probably added to that. After those initial couple of confusing bites, I finally evaluated what I was tasting. 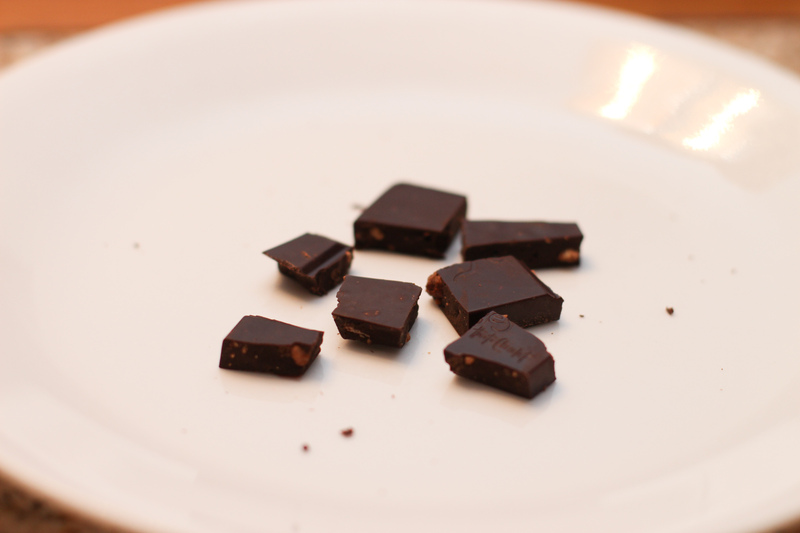 Yes, there was this veggie flavor in the chocolate that was almost so faint that I could hardly taste it. What I could taste of it, though, was mostly in the back of my mouth and made me congratulate myself for a second on finding a way to fit in my vegetable food group with my chocolate. The texture confused me a little as well. A few more bites (er, squares) later, I decided it must just be the crunchy rice (?) or whatever inside to give it such an interesting texture. Surely not the carrot doing that. But the crunch was almost toffee-like in how it felt between my teeth and the way it stayed behind even when the delicate chocolate surrounding it melted away. 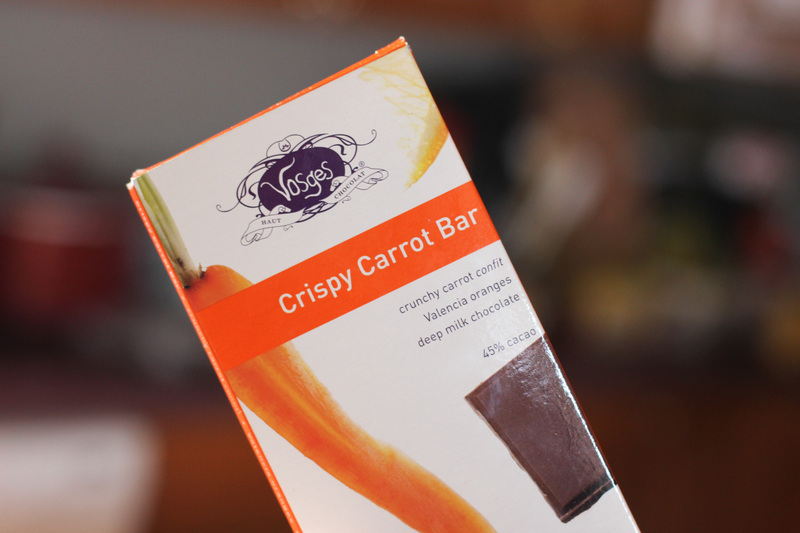 As both a dark chocolate aficionado and proud bacon connoisseur, I think I preferred the dark bacon chocolate, but I was still happy to scarf down the entirety of the carrot bar too, despite how confusing it was to my taste buds and tongue. You may think I’d probably eat both of these anyways because of my chocolate addiction, but I beg to differ. I’ve consumed so much chocolate in my 20 years that I have no time for poor quality chocolates. (Alright, well only out of desperation maybe.) 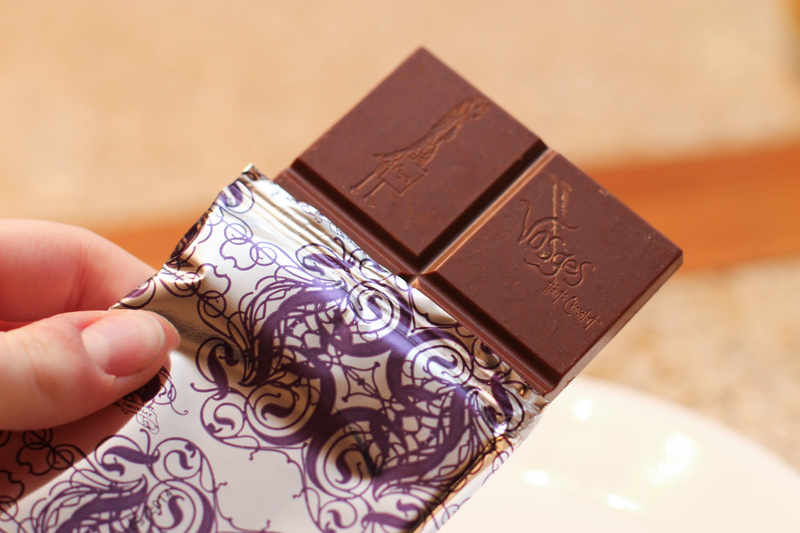 But I can definitely say that Vosges has some pretty darn good chocolate with an aftertaste that lingers, begging me to eat yet another square of this chocolate, lest my mouth water for more. The best things in life are, indeed, free, although I’m willing to pay for a few more bars of that that bacon chocolate. Nom nom nom. And that, kids, is why you should always say yes to chocolate. 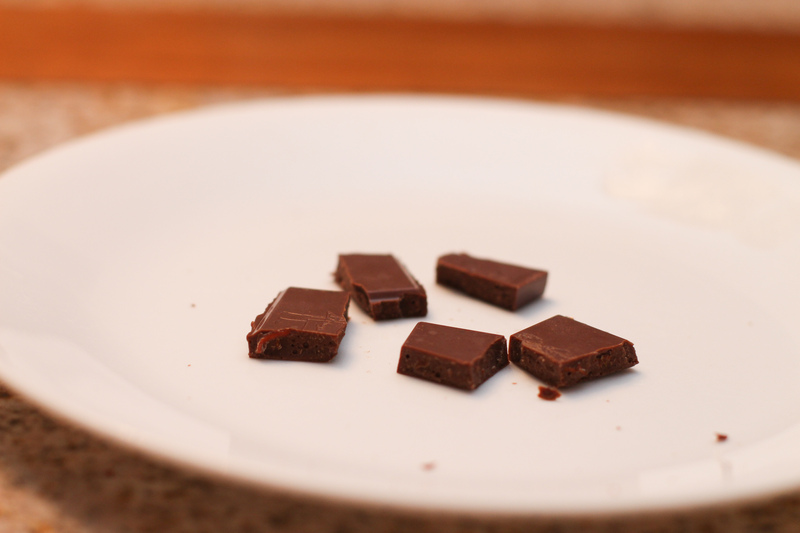 This entry was posted in dessert, Life and tagged bacon, bacon chocolate, candy, carrot, carrot chocolate, Chicago, chocolate, chocolate bars, food, taste test, Vosges, Vosges Haut-Chocolat. Bookmark the permalink.